This French toast is where it's at. It's far too tasty for how easy and quick it is. You also won't believe its healthy! Nom Nom Nom! !This recipe comes together in minutes and it's quick enough to whip up a batch before work or school! You'll be so glad you did, I promise. 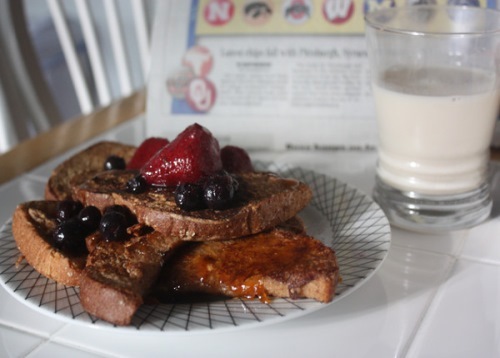 This French toast is where it’s at. It’s far too tasty for how easy and quick it is. Plus without the egg and frying oil, it's fat-free too! Cut bread diagonally and set aside. Heat non-stick griddle or flat pan. Whisk non-dairy milk with remaining ingredients in a shallow bowl. Quickly dip a few bread slices into wet mixture and cook for about 3 minutes on each side, repeating with leftover until no more bread is remaining. Garnish with powdered sugar and fresh fruit slices.